This is an isolated LIN Bus breakout board using the TJA1028 and MAX12931 ICs. LIN (Local Interconnect Network) is a serial network protocol used for communication between components in vehicles. The need for a cheap serial network arose as the technologies and the facilities implemented in the car grew, while the CAN bus was too expensive to implement for every component in the car. European car manufacturers started using different serial communication topologies, which led to compatibility problems. 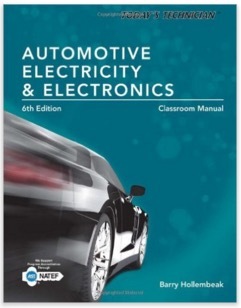 Ideal for aspiring and active automotive professionals, TODAY'S TECHNICIAN: AUTOMOTIVE ELECTRICITY & ELECTRONICS, Sixth Edition, equips readers to confidently understand, diagnose, and repair electrical and electronic systems in today's automobiles. Using a unique two-volume approach to optimize learning in both the classroom and the auto shop, the first volume (Classroom Manual) details the theory and application of electricity, electronics, and circuitry in modern automobiles, while the second (Shop Manual) covers real-world symptoms, diagnostics, and repair information. Known for its comprehensive coverage, accurate and up-to-date technical information, and hundreds of detailed illustrations and vibrant photographs, the text is an ideal resource to prepare for success as an automotive technician or pursue ASE certification. Now updated with extensive information on new and emerging technology and techniques--including audio and infotainment systems, LED and adaptive lighting, hybrid and electric vehicles, and accessory systems--the Sixth Edition also aligns with the NATEF 2012 accreditation model, including job sheets correlated to specific AST and MAST tasks. Click the button below to add the Isolated LIN Bus Breakout Board to your wish list.